These two discount store chains are enjoying solid year-to-date gains. Should investors put money into either company? 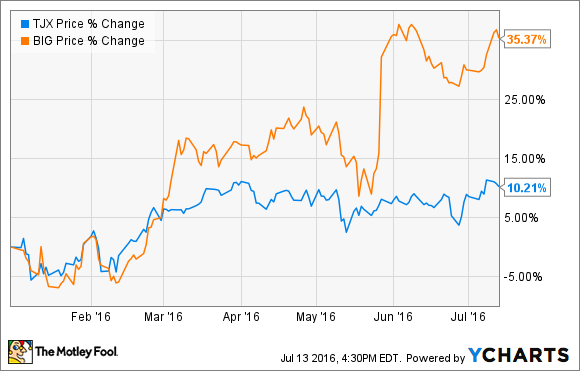 Discount retailers Big Lots (NYSE:BIG) and TJX Companies (NYSE:TJX) are having a great 2016. Shares of both companies are up by double digits year-to-date despite the struggle in the broader U.S. retail sector. What are their success stories attributable to, and which stock is a better buy for investors right now? Big Lots is a non-traditional big box retailer. The company offers a rotating lineup of heavily discounted name-brand goods in the food, furniture, electronics, and seasonal departments. At last count, the company operated 1,448 stores in 47 states. Despite a slowdown at other brick-and-mortar general retailers this year, Big Lots just posted its ninth straight quarter of increasing same-store sales. The company also saw an increase in total sales and net profit of 2.5% and 20.2%, respectively, during the first quarter of its fiscal 2016. On top of the strong performance in 2015, the company also increased its guidance by 4.5% to 4.7% for the rest of 2016. If those results are achieved, it would increase profits by 11% to 16% over last year. What is the company doing right? Big Lots adjusts the square footage it devotes to different retail categories depending on sales performance. Home goods and furniture have been big performers as of late, so the company has been moving space away from other categories such as food and electronics to provide more of what has been selling best. Though Big Lots is primarily a brick-and-mortar operation, the company has been leveraging technology as well. The online store has seen particular success in selling seasonal and home goods. Management has also increased its online advertising and reports ongoing efforts in leveraging its Facebook page with customers. Always on the lookout for evolving trends in consumer spending, 2016 will also see Big Lots equipping its in-store teams with new tablets to provide real-time updates on sales metrics. The combination of heavy discounting and a revolving lineup of merchandise tailored to consumer demand has been a powerful duo for the company. That uptrend looks as if it will continue through the rest of the year. TJX is the world's largest "off-price" retailer of apparel and home goods. Best known in the U.S. for its T.J. Maxx and Marshall's chains, the company operated 3,661 stores and three online stores in nine countries at last count. The TJX family of stores has also been bucking the retail trend. In its first quarter, total sales increased 10%, same-store sales increased 7%, and profits increased 10%. Because of the strong first quarter, the company upped its guidance for 2016 and expects a 1% to 3% increase in profits over last year's figures. These numbers are impressive, considering the strong headwinds TJX has been facing with currency markets. About a quarter of the company's sales come from outside the United States. As the U.S. dollar gains in value relative to other currencies, the contribution of these international sales decreases when TJX converts the currency back to dollars. The strong increase in traffic in stores more than offset those difficulties. How is TJX finding ways to grow? The company cites consumers increasing price-conscious decision-making is key. Where other retailers are struggling from a slowdown in global consumer spending, the TJX strategy of delivering name-brand apparel and home décor at closeout prices is resonating with shoppers. To increase profitability, the company has been closing down underperforming stores and is on track to remodel 240 locations this year. While store count dropped in the past year, the company says it sees room for an additional 2,000 stores just in its existing markets. Management has 195 new stores slated for opening with no more store closures planned for the rest of 2016. Riding momentum from increased consumer interest, TJX sees its new store openings in current markets and new markets driving annual sales to $40 billion. The company is still a way off from knocking on that door, with last year's sales totaling $31 billion, but investors have to be excited about the strong results as of late. While I think both retailers have a bright future ahead, I like Big Lots at the moment. Not only is it a smaller company with more room for expansion in the U.S. and abroad, but I also like the larger lineup of merchandise that adds electronics and food to the apparel and home-goods departments. Big Lots also totes a cheaper valuation at the moment than the TJX Companies. Its PEG ratio, a measure of current stock valuation relative to future expected growth, still indicates that the company is fairly valued at 1.0. After its big multi-year run-up in share price, TJX Companies has a PEG of 2.2, indicating it is currently overvalued by that measure. With a rotating mix of discounted retail, an embrace of technological selling and advertising, and a friendly stock valuation, Big Lots is my better-buy pick.